We Need to Talk About Food. In coming decades the world faces the risk of major regional food crises leading to conflicts and mass refugee movements. This is driven primarily by emerging scarcities of all the primary resources required to produce food and a global failure to reinvest in it. Introduction – What’s Food Got to Do With It? A discussion paper by Julian Cribb and Associates, summarised from ‘The Coming Famine: the global food crisis and what we can do to avoid it‘ published by the University of California Press and CSIRO Publishing, August 2010. “Julian Cribb’s, The Coming Famine, shocked me into action. It ripped me from my lull and made me reconsider how I ate and what I was doing for the planet on a day-to-day basis. Although sometimes uncomfortable in its clarity and urgency, it never exaggerates the food system challenges we face. Here, Julian and his colleges have summarised the book’s findings, with suggestions of some bold solutions. I’m yet to find a better introduction of the issues, so please read it for an express education on the environmental issues we face when it comes to our food system.” Cassie Duncan, Co-founder of Sustainable Table. These issues will now be explored under the relevant headings. Note: Not all views expressed in this essay are necessarily supported by Sustainable Table, however, it poses an exceptional view of the current state of our food system and the ways forward to avoid global famine, wars and further crises. In coming decades the world faces the risk of major regional food crises leading to conflicts and mass refugee movements. This is driven primarily by emerging scarcities of all the primary resources required to produce food and a global failure to reinvest in it. This paper outlines key factors in emerging global food insecurity and proposes some solutions. 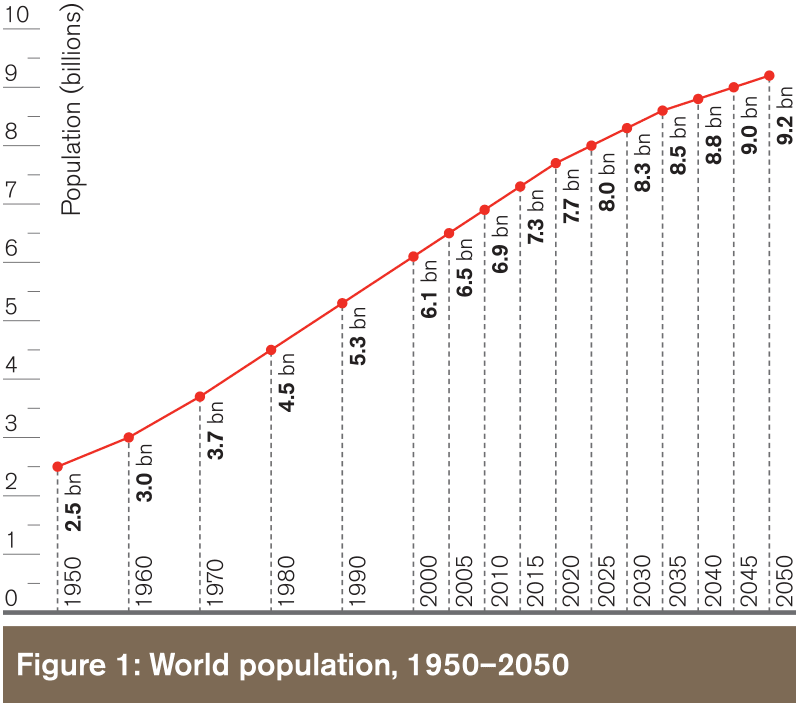 Most of us have by now heard the forecast that there will be 9.2 billion people in the world by 2050. But current projections suggest human numbers will not stop there – it will keep on climbing to at least 10-11 billion by the mid 2060s. The central issue in the human destiny in the coming half century is not climate change or the global financial crisis. It is whether humanity can achieve and sustain such an enormous harvest. The world food production system today faces critical constraints. Not just one or two, but a whole constellation of them, playing into one another – and serious ones. This is the great difference from the global food scarcity of the 1960s. Then the constraints were around skills and technology – and the generous sharing of modern agricultural knowledge and technology in the Green Revolution was able to overcome them. Today the world faces looming scarcities of just about everything necessary to produce high yields of food – water, land, nutrients, oil, technology, skills, fish and stable climates, each one playing into and compounding the others. So this isn’t a simple problem, susceptible to technofixes or national policy changes. It is a wicked problem. The world is haemorrhaging nutrients at every link in the chain between farm and fork. On the farm it appears that anywhere up to half of applied nutrients (in the form of fertiliser) can be lost into soil, water and the environment. 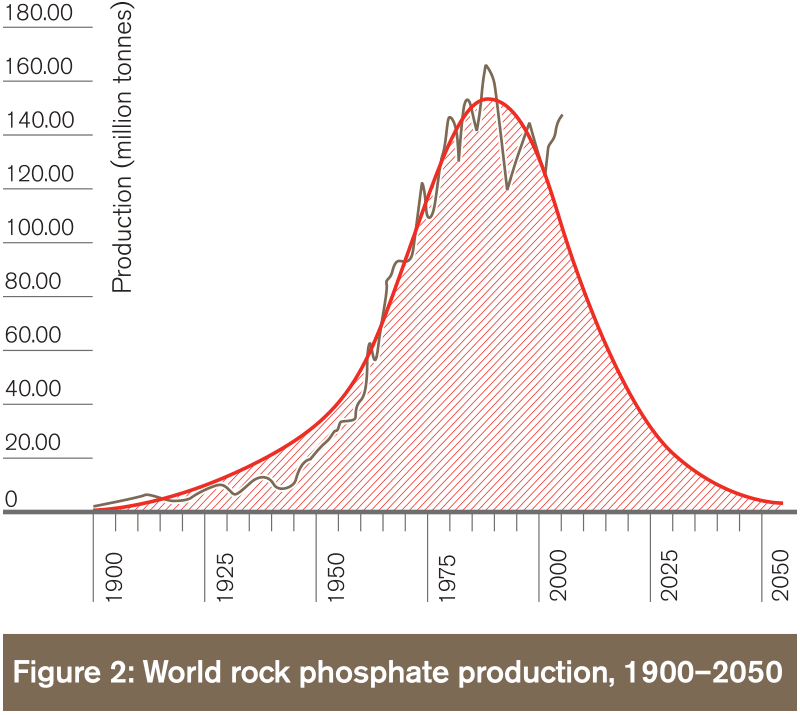 Our resources of mineral nutrients are starting to decline. When Canadian Patrick Dery applied Hubbert’s peak theorem to phosphorus (Figure 2) he found, to his dismay, we had passed it in 1989. According to the International Energy Agency, peak oil and gas are due in the coming decade. These spell scarcity and soaring prices in the primary nutrients – nitrogen (N), phosphorus (P) and potassium (K) – that sustain all advanced farming systems worldwide. In food production there is no substitute for these three nutrients: they are as essential to plant growth as water and light. At the other end of this equation we are ruining our rivers, lakes, seas and oceans in ways that prevent us from getting more food from them. Each year we pump around 150 million tonnes more nitrogen and 9 million tonnes more phosphorus into the biosphere than the earth’s natural systems did before humans appeared: we have utterly modified the planet’s nutrient cycle, more radically even than the atmosphere or fresh water cycle. That we may double our release of nutrients to the environment as we seek to redouble food output is alarming. 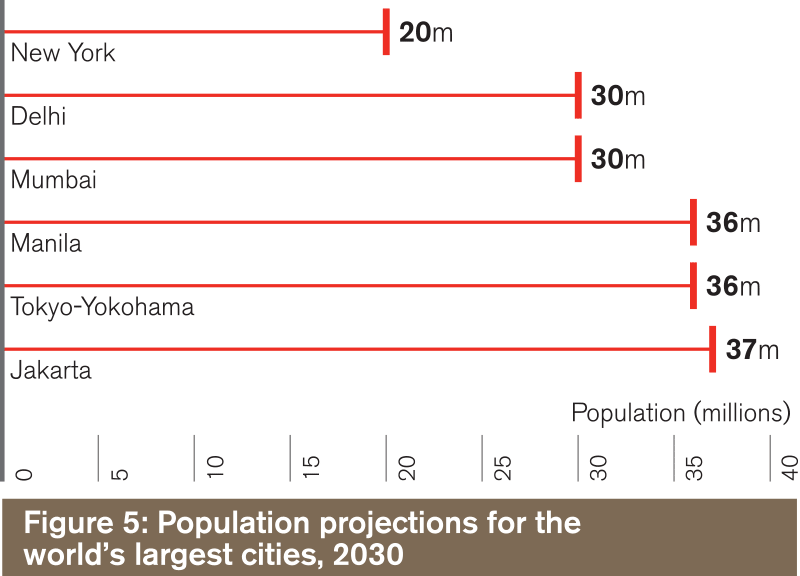 By 2050, 7-8 billion people will inhabit the world’s cities. They will use about 2,800 cubic kilometres of fresh water – more than the whole of irrigation agriculture uses worldwide today. Desalination may supply some but for most cities, it will be cheaper and simpler to grab the farmer’s water. This is already happening around the world. Then there is the slice of farm water that climate change is already stealing, whether it is rainfall over the great grain-bowls, evaporation from storages, shrinking rivers and groundwater or the loss of melt-water from mountain regions. The Himalayan glaciers are disappearing – the only debate is how fast. And the North China Plain is running out of water. These two regions feed 1.7 billion people now and must feed twice that many in the future. If they fail, the consequences will affect everyone. Worldwide, groundwater levels and rivers are dropping as they are pumped dry. 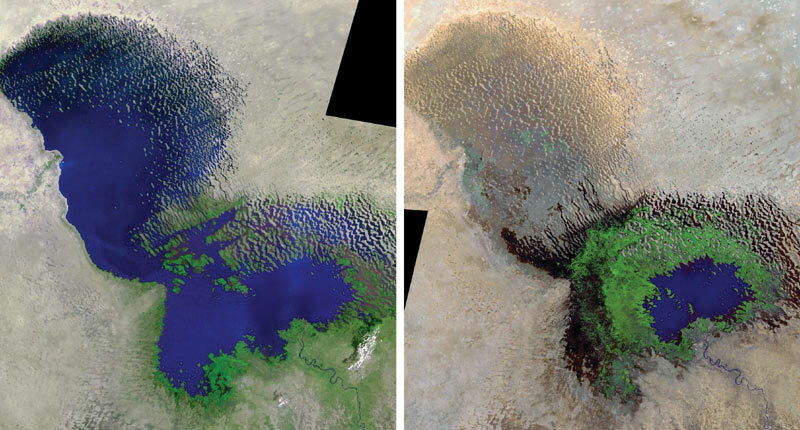 Immense water bodies like Lake Chad (Figure 3) are simply vanishing. Australia has overexploited its vast Murray-Darling basin. The world is becoming dotted with dried up Aral Seas, like aquatic tombstones. 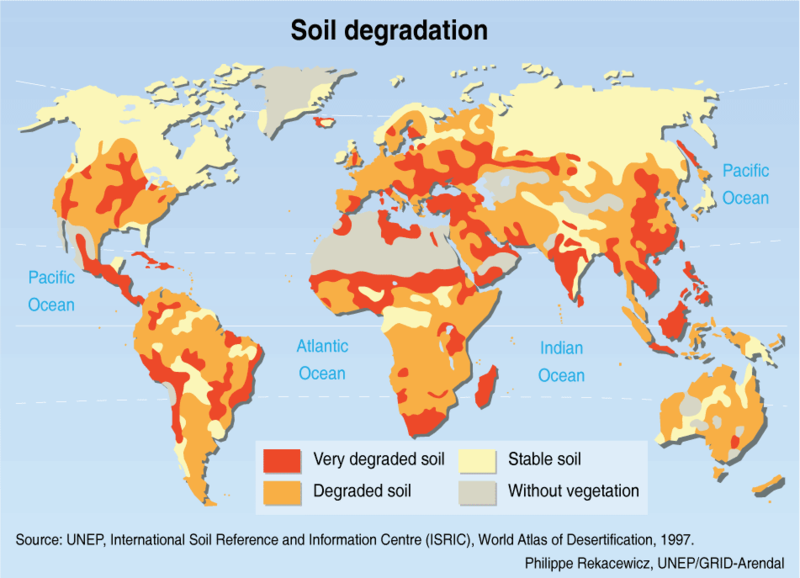 Today almost a quarter of the world’s farmland is affected by serious degradation (FAO 2008), up from 15% two decades ago. The Food and Agriculture Organisation (FAO) study indicates the world may currently be losing about 1% (50,000 sq kms) of its farmland annually – due to a combination of degradation, urban sprawl, mining, recreation, toxic pollution and rising sea levels. If we’ve already lost 24% and we lose around 1% a year from here on in, you can figure out for yourself how much land our grandchildren will have left to double their food supply on. In 1900 every human had 8 hectares of land to sustain them – today the number is 1.63 and falling. Put another way, between 1990 and 2005, world demand for food grew 15 times faster than the area of land being farmed. By 2050 the total area of farmland buried under cities may exceed the total landmass of China, and the total area of land diverted to recreation and other non-food activities may rival that of the United States. This is nearly all prime farm land in river valleys and on coastal plains. Many cities will have 20, 30 and even 40 million inhabitants – yet little or no internal food production capacity. They will be in huge jeopardy from any disruption to their food supplies. Then there’s waste. In developed countries such as Australia and America we throw away from a third to half of all food produced, in developing countries we lose similar amounts post-harvest. Put another way, half the achievements of world agricultural scientists and farmers of the past 50 years are going straight to landfill. For more information on waste, visit Food + Packaging Waste. 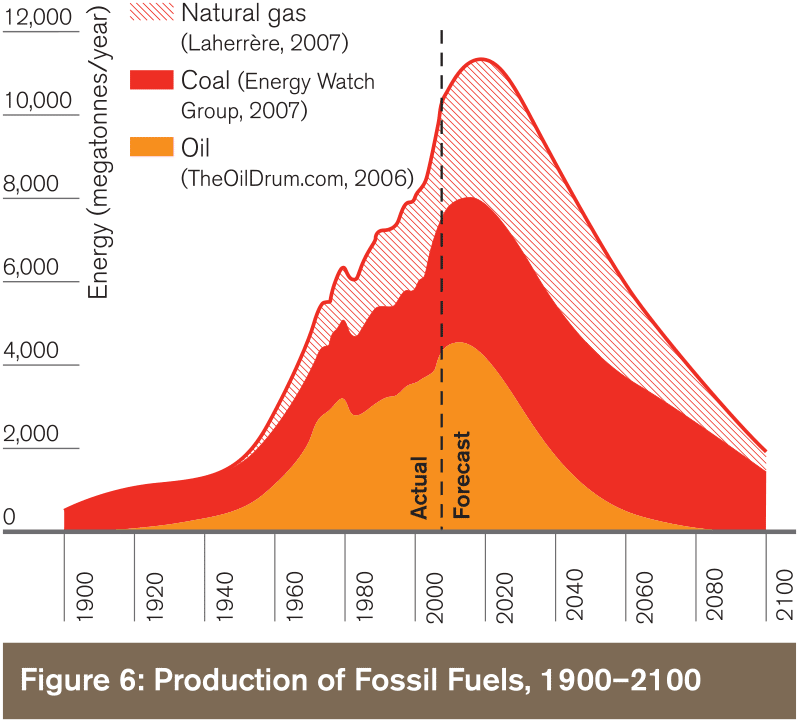 Peak oil (Figure 6) has already happened according to the International Energy Agency (IEA). It has happened in the United States, in Australia, Britain, Saudi Arabia and in 50 out of 65 of the world’s oil producing regions. Yet 60 million new cars hit the world’s roads every year. Just as farmers have little control over who snatches their land, water and other assets, they have little control over who takes their fuel. By 2040 dwindling reserves of fossil oil may well be reserved for the military and everyone else will have to get by as they can, including food producers. The average citizen of a developed country today effectively consumes 66 barrels of oil a year, such is the dependency of our modern food systems on fossil fuels. The high-yielding crops we pin our hopes on will be of little use if there is not enough fuel to sow, harvest or transport them. One of the most pressing questions is where the energy to power the world’s tractors, trucks, trains, planes and ships that move the food will come from in the future. It cannot come from the farm in the form of biofuel: to do that would reduce world food output by 10-30%, at the same time as we need to double it. We urgently need to convert our farming systems to another energy source, algal biodiesel maybe. Or hydrogen. Or solar-electrics. But there seems little sense of urgency about this issue from governments. Natural gas will also peak shortly and since it helps to make 97% of the world’s nitrogenous fertiliser, an N scarcity is also on the cards. Using coal to make fertiliser does not seem smart, as its contribution to climate change is to create more drought and hence lower crop yields. Consumers may be more than a little angry if asked to pay $30 or $40 for a loaf of bread. Compare how much real grain prices increased in the 2008 oil price surge (very little) with how much they went up under the major oil shock of the 70s. The risk of soaring global food prices in the event of a world energy shortage is real. Also lying in wait for us is a marine time bomb. 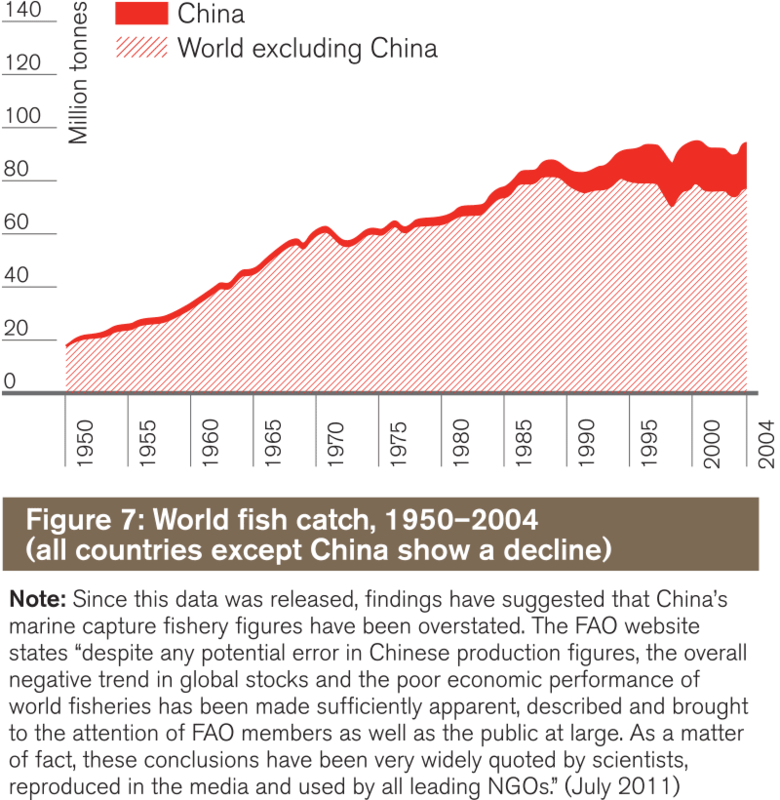 29% of world fisheries are in a state of collapse according to Canadian scientist Boris Worm and colleagues (2007). The majority could be gone by the 2040s they warn. Plagues of jellyfish in the world’s oceans signal the impact of overfishing and nutrient pollution, while carbon emissions are turning them acidic, imperilling the entire marine food chain. The Food and Agriculture Organisation (FAO) says “the maximum wild capture fishery potential from the world’s oceans has probably been reached – (Figure 7). ‘Peak fish – actually occurred in 2006. If we cannot double fish production as food demand doubles, then we will have to get the additional 100 million tonnes of meat from land animals. This will require a billion tonnes more grain and 1,000 cubic kilometres of extra fresh water. FAO’s projected increase in world meat demand by 2050 is 185 million tonnes. Add this to the fish deficit and we would need to discover three more North Americas to grow sufficient grain to feed all these animals. This gives some impression of the scale of the challenge of meeting global protein demand by the mid-century. All this is taking place at a time when the climate that gave birth to agriculture is changing, possibly forever. For more information on our oceans and how to consume sustainable seafood, visit Fish + Seafood. The UK’s Hadley Centre projects that drought could regularly affect 40% of the planet’s land area by the end of this century. Their soil moisture projection suggests that regions once thought to have big farming potential, like Brazil, southern Africa and the Indian grain bowl, may prove unreliable. The International Food Policy Research Institute has warned of a potential 30% drop in irrigated wheat production in Asia and 15% in rice, due to climate factors. The World Bank fears African productivity could halve and India’s drop by as much as 30%, unless urgent steps are taken. 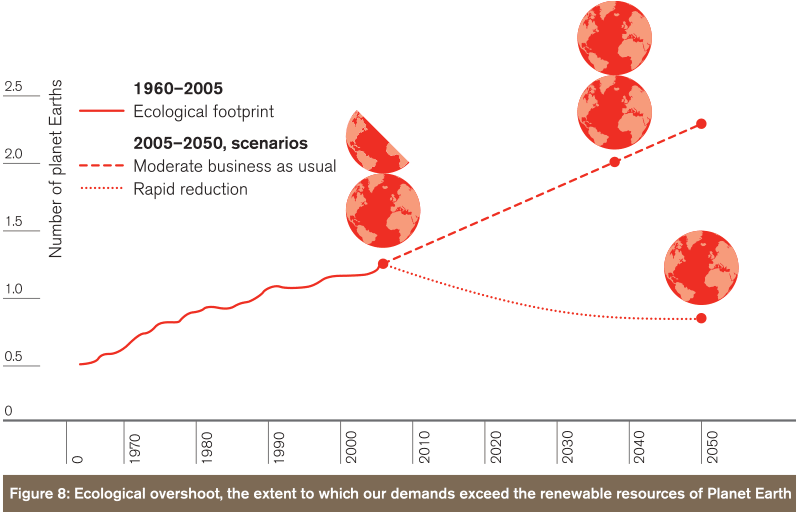 Ecological overshoot is the term used by the Global Footprint Network (GFN) to describe how humanity now withdraws more resources from the planet than it is able to replace in a year. The GFN estimates we already consume the total productivity of 1.3 Earths in food, water, energy and other resources (Figure 8). If the trend continues, they say we will be using 2 planets worth of production by 2050. If the GFN is even partly correct, then today’s diets and agricultural systems are not sustainable in the longer term for a world of 10 billion or more people. We must reinvent them. The challenge facing the coming generation of food producers and agricultural scientists is thus to double the global food supply; using half the water, on far less land and with increasingly depleted soils, without fossil fuels, with increasingly scarce and costly fertiliser and chemicals under the hammer of climate change. Furthermore, farmers are going to have to accomplish this miracle using less science and technology. On top of the scarcities of land, water, energy and nutrients the world’s farmers are driving into a huge technology pothole. This is the result of decisions by national and regional governments worldwide, by aid donors and academic institutions, to slash resources for agricultural research and extension over four decades. This has happened in the US, Germany, Britain, France, Japan, Australia and China. In the year 2000 the rich countries spent just 1.8 cents in every research dollar on agricultural research, so unimportant has the issue of sustaining food production become to them. Between 1980 and 2006 the proportion of the world’s aid budget devoted to raising food output fell from 17% to just 3%. The cost is high. In local research stations, in national agriculture departments, in universities, colleges, research agencies and in the international agricultural research enterprise, support has been cut or allowed to erode, hundreds of labs and field stations have been shut, and thousands of vital research programs terminated. Of the scientists who fed the world in the past 40 years most have quit – in anger, sorrow, or disappointment – have been fired, or have retired. The dilapidation in the enterprise that feeds the Earth has disheartened a generation of young would-be agricultural scientists, especially in developed countries where many universities and colleges of agriculture cannot find enough students to fill the places they offer. Disciplines vital to reinventing agriculture, like soil science, are languishing. Global funding for agricultural research, public and private, is estimated to total around $40 billion. There is a stark contrast with the $1,500 billion the world now spends on weapons. 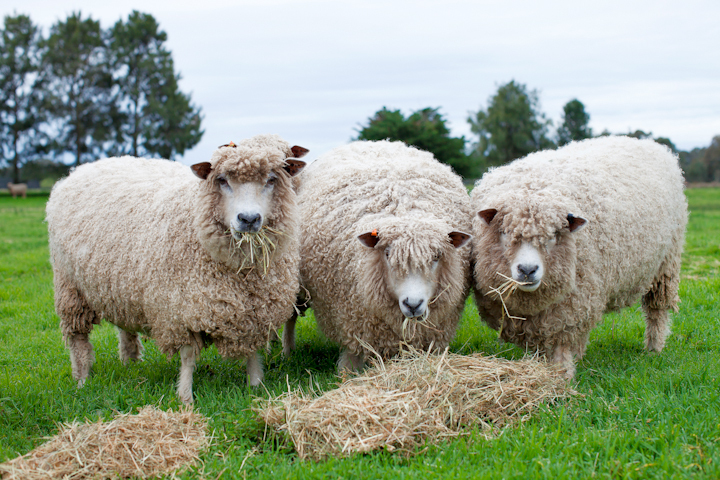 There has been almost no real increase in funding of the international agricultural science effort since the 1970s – although the human population has doubled. 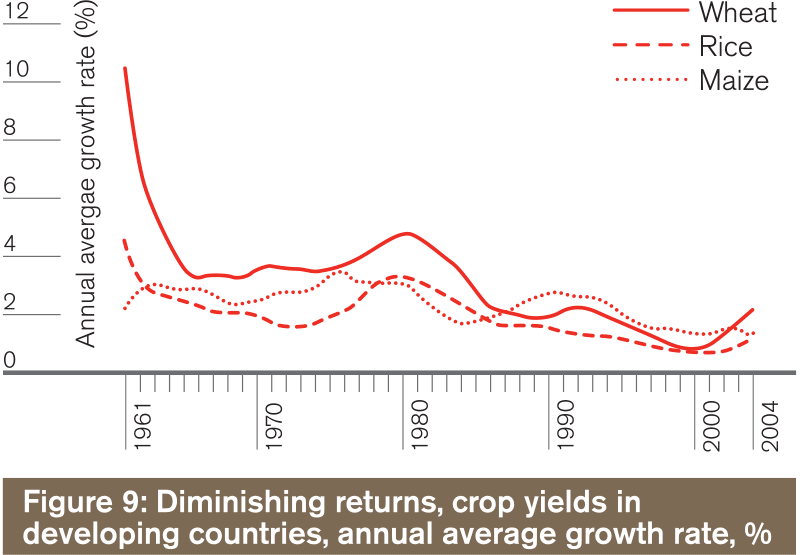 The effects of all this are plain in the declining growth in world crop yields and farm productivity (Figure 9). The gains are now below 1% a year – less than half what is needed to keep us fed. Generally speaking, it takes around 20 years for a piece of research to be completed, turned into technology or advice, commercialised and adopted by millions of farmers worldwide. Often far longer. The global decline in agricultural R&D in the past four decades (Figure 10) means less new technology will be available to farmers between now and 2030 than in the past two generations. Also, by its nature, much of the existing new technology will not help to raise global food output because it is geared more to the needs of agribusiness corporations than it is to the needs of farmers or consumers. Much of this technology is quite unsuitable for use in the developing world or in smallholder agriculture, and will do nothing to overcome hunger and un-sustainability as it is highly dependent on costly and increasingly scarce inputs. So the rate of technology diffusion from the developed to the developing world is likely to fall. There is an urgent need, not only to redouble the agricultural research effort worldwide but to develop a new co-agriculture – that is sustainable and less dependent on heavy use of energy, water, nutrients and other increasingly scarce industrial inputs. Creating it is humanity’s most pressing scientific challenge. A new food producing system has to be science-based. It has to be low input. It has to replenish, not destroy. And it has to work for farmers large and small, everywhere. If we fail, the consequences will be profound. Modern wars are often driven by scarcities of food, land and water. Darfur, Rwanda, Eritrea and the Balkans were all destabilised, at root, by squabbles over these resources. Going further back, the French and Russian civil wars both grew out of bread crises. We know that hunger breeds war. The UK Ministry of Defence, America’s CIA, the US Centre for Strategic and International Studies and the Oslo Peace Research Institute all identify famine as a potential trigger for conflicts and possibly even for nuclear wars. The wars of the 21st century are less likely to be global conflicts with sharply defined sides and huge armies than a scrappy mass of failed states, rebellions, civil strife, insurgencies, terrorism and genocides sparked by bloody competition over dwindling resources. In 2010-11 we saw two governments – Tunisia and Egypt – brought down by riots that began as food protests. Back in history the French and Russian revolutions both arose out of food crises. Our politicians do not seem to understand that if food runs short, they are cactus. However, the good news is that many wars can also be prevented – by using science to meet the rising demand for sustenance, despite the constraints already described. Refugee and internally displaced person numbers have risen sharply in recent years and are in the headlines daily. Future famines in any significant region – Africa, India, Central Asia, China, Indonesia, Middle East or any of the megacities – will confront the world with tidal waves of tens, even hundreds of millions of refugees. But the 50 million refugees who now flee every year are now preceded by over 200 million legal immigrants – a quarter of a billion people on the move each and every year. These are mostly people smart enough to read the signs in their home countries – and leave before disaster strikes. Yet such vast movements are nothing compared with the movements of the future. These will dwarf the greatest migrations of history. Thanks to the universal media, all the world now knows that safety, sustenance and a good life are to be found elsewhere if you have the courage and the means to reach for them. In future, even places that are physically remote may face refugee tides in the millions or tens of millions, threatening profound change to society. If we fail to secure the world’s food supply, governments in many countries may collapse under the onrush of people fleeing regional sustenance disasters. Every nation will face heavier aid and tax burdens and soaring food prices as a result. Solving the challenge of global food insecurity should be the paramount concern of all nations and all people in the coming three generations. The global financial crisis is trivial in comparison. If we don’t want wars and tidal refugee movements, one way we can prevent many of them is by securing the food supply – everywhere. Recognising that 11 billion people cannot all eat like Americans or Australians and hope to survive on this planet, we need to refashion the world diet. To one that involves far less energy, land, water, nutrients and pollution. To one that doesn’t actually kill half the people who eat it, as does our present one. Sounds hard? Not really. It means returning to the sort of balanced nutrient intake our grandmothers would approve of. One way to do this is to double the amount of vegetables in the diet, many produced in the these new urban systems using recycled water and nutrients. There are over a thousand undiscovered – indigenous vegetables to make this a culinary adventure as well as a global awakening and a health revolution. The richness of nature has scarcely been tapped in this regard and our shops, supermarkets and restaurants are poor in diversity compared with what they will become. To achieve this we should also embark on the world’s most ambitious educational campaign – to install one full year, a food year, in every junior school on the planet. A year in which every subject – maths, language, geography, science, society and sport – is taught through the lens of food, how precious it is and how it is produced, where it comes from, how to eat safely, thriftily and healthily. How to help ensure it never fails. Teaching food is acceptable in all cultures, races and creeds. Teaching respect for food and how it is produced is equally so. The means already exist to share these principles and educational courses universally. We must enlist the food processing industry, the supermarkets, the cookbook writers and nutritionists, the TV chefs and restaurants and the health departments to promote the same universal messages. Eat well but eat less. Eat more vegetables and less energy-intensive foods. Choose foods that spare our soil and water. Be happy to pay more for such good food, so our farmers can protect the precious environment that produces it. Today many people enjoy the cheapest food in human history. In rich countries it is one third the price our grandparents used to pay for it. But it is destroying landscapes, water and farming communities worldwide and causing colossal wastage. Food is too cheap to last. It is imperative in the coming decade that we do two things – first abolish all trade barriers so food production can go wherever it is most efficient and second, to start paying all farmers a fair price. The prices that globalised food chains now pay farmers will end up destroying most of agriculture and its resource base. They will hollow out global food security. An obvious way to enhance global food security is to reduce the colossal waste of half the food we currently produce. This will also spare water, nutrients, energy, soil and human labour. However it means extensively redesigning our diets, our cities and the food production and distribution systems that satisfy them. It means greening our cities, mining and recycling the vast volumes of water and nutrients they presently collect, purifying them and designing entirely new urban-based food production systems. This will involve growing large quantities of fresh vegetables within urban areas by hydroponic, aquaponic and aeroponic methods. We need to design this new urban agriculture or mass permaculture from scratch and incorporate it into the buildings, landscapes and social milieu of our megacities. It will also involve creating an entirely new food industry that uses waste to produce vegetable, microbial, fungal and animal cells in biocultures and turns them into healthy and novel processed foods – but also into fuel, fertiliser, stockfeed, pharmaceuticals and fine chemicals. Above all, we need to declare a World War on Waste. Let us design farming and food systems that do not waste or, if they do, that then reuse. We need to redouble the global investment in agricultural science. 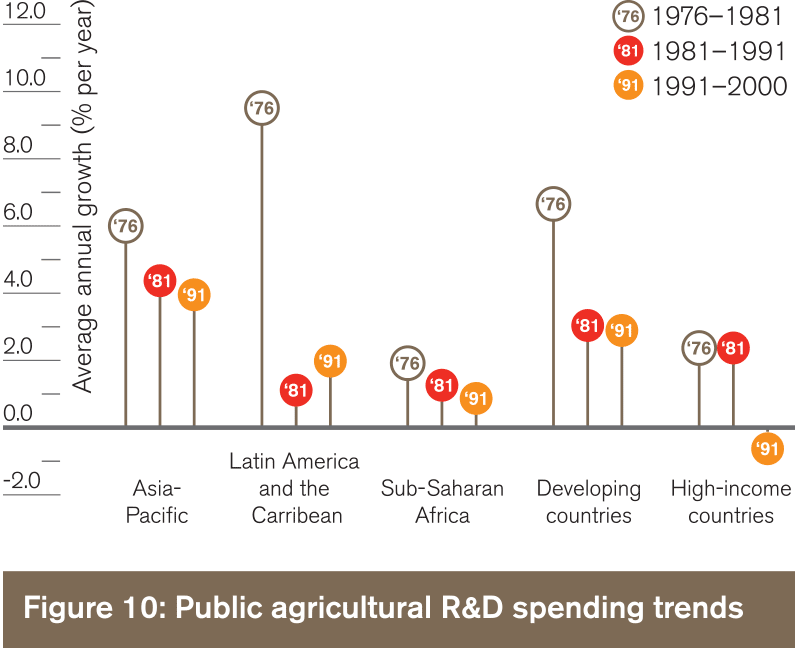 In my estimate we should lift the total agrifood R&D spend to at least $80 billion, twice what it is today. Then, for every research dollar we need to spend another dollar getting the knowledge into the hands of the world’s 1.8 billion farmers and food processors. Science not applied is science wasted. We must generate the greatest knowledge sharing effort in history – to reach not only farmers, but also consumers everywhere, because the farmers alone will not be able to solve the challenge. Using the excellent mass communication and media systems now available and ramifying through the world, this is completely achievable. It is essential that all national governments understand that agricultural science IS defence spending. Devoting just a tenth of the world’s current weapons spend to sustainable food production would secure both the food supply and enhance the prospects of world peace. The coming famines of the mid-21st century cannot be solved by governments, by scientists or by farmers alone. We need a change in behaviour by every person on the planet, especially in rich and urban societies. This is a challenge at the species level. It will decide, once and for all, whether or not we are truly worthy of the title Homo Sapien (wise human). Farmers not only grow food. Our 1.8 billion farmers – mostly women – also manage half the world’s land, three quarters of its fresh water, a third of its atmosphere and much of its wildlife. They need our help to do so. And they need fair prices for their produce to do so sustainably. Farmers, and the scientists who serve them, are today the most important human beings alive. The world has forgotten this. It needs to be reminded. Delivering new farming systems and technology to all the world’s farmers, paying fair prices and changing our eating habits is a matter of both national and global urgency. It is time that humanity as a whole, and governments in general, awoke to this. Receive foodie and environmental news, event invitations and Sustainable Table updates.